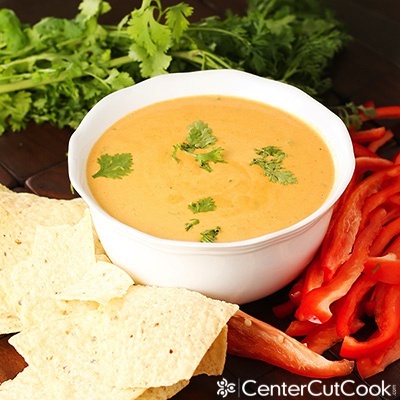 This oh-so Cheesy Chipotle Dip comes together in a snap because it’s made in the blender! Served with red pepper strips and tortilla chips this is a fun dip to serve at parties! A dip made in the blender? Get out! How cool is that? I made this delicious oh-so Cheesy Chipotle Dip in my Vitamix blender and it was so easy. Now let’s talk about this dip! It’s a pretty simple dip that comes together quick! I’m talking quick as in 5 minutes. You’ll start by prepping the cheese. You’ll need a total of 16 ounces of cheese cut into cubes. I went with Havarti because I am a Havarti fanatic, and monterrey jack. Make sure the cheese cubes are nice and cold before you toss them in the blender. You’ll get a better result if the cheese is cold when you go to blend it. It’s funny because both of the cheeses used with this dip are white, yet my dip looks orange. The beautiful color of this dip is due entirely to the chipotle peppers in adobo sauce. You can find these guys in the Mexican section of the international foods aisle of your grocery store usually in a small can. You’ll need anywhere from 1-2 peppers, depending on the spiciness level that you’re comfortable with. I went with two peppers because I like things a bit spicy, but stick with just one pepper if you like things a bit more mild. Typically there are a bunch of chipotle peppers in one can. Whatever is leftover can be used to make Chipotle Chicken Club Sandwiches or Slow Cooker Shredded Beef Tacos – both excellent recipes that use the chipotle peppers! Along with the cheese and the peppers, you’ll need a little chicken stock, fresh lemon juice, cornstarch, garlic powder, black pepper and a little cilantro. The way this works is that you’ll toss all the ingredients into the Vitamix (except the cilantro), turn it on high for a few minutes and wooola! Creamy, smooth, Cheesey Chipotle Dip! Once you have a creamy, smooth mixture in the blender, you’ll transfer it to a fondue pot to warm it up a bit more, or you could just transfer the dip to a microwave safe bowl and microwave the dip for about a minute or until it’s nice and warm. I served it with red pepper strips and tortilla chips. Right before serving, I stirred in about a tablespoon of chopped fresh cilantro. Yum! 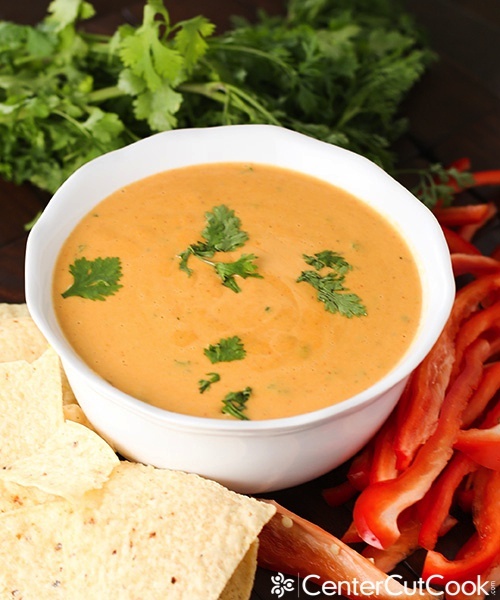 Easy Cheesy Chipotle Dip! Place all ingredients (except the cilantro) in your Vitamix in the order listed. 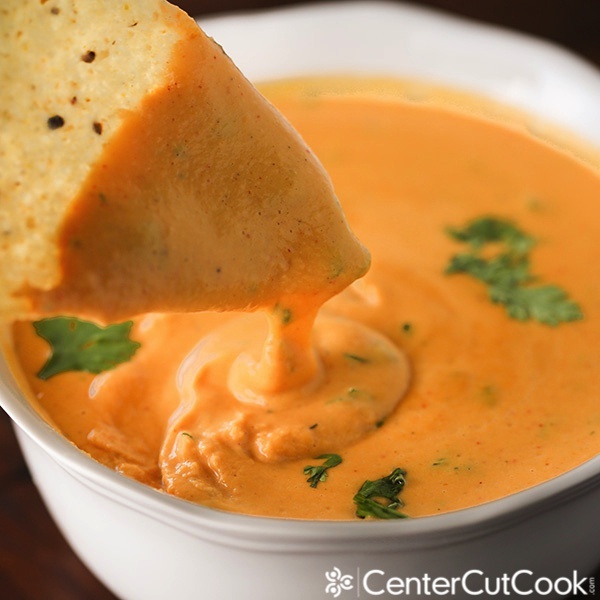 Blend the mixture on high for 2-3 minutes, or until the dip is smooth and creamy. Transfer the dip to a microwave safe bowl and microwave for about 1 minute, or until heated through. Alternatively, you could use a fondue pot to heat the dip. Right before serving, stir in 1 tablespoon chopped fresh cilantro. Serve with red pepper strips, and tortilla chips. Enjoy!